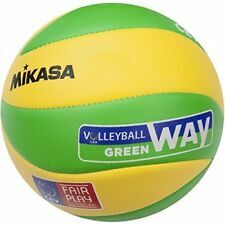 Mikasa CEV Champions League Official Game Ball volleyball MVA200CEV Japan new . 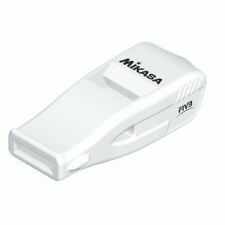 Mikasa whistle Volleyball Referee white BEAT-W Japan new . 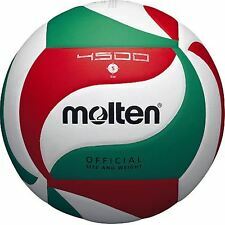 Mikasa MVA400ATTR Volleyball Training Ball No. 4 Women Japan new. 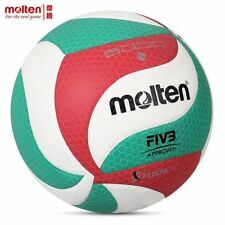 This ball was created for the club volleyball teams and players. 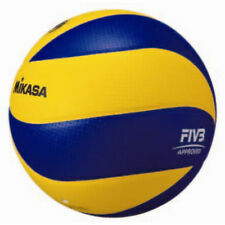 The FIVB has adopted this ball as the official and exclusive ball of international competitions. The eight panel spiral construction gives players more surface area to touch the ball allowing for better passing and set accuracy. 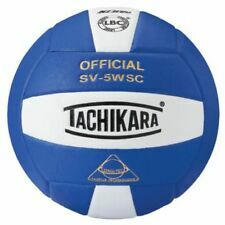 An exclusive soft micro-fiber cover and a nylon wound center make the Mikasa MVA200 Olympic Official Volleyball durable and comfortable to handle. 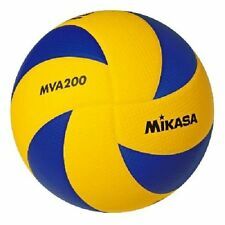 This blue/yellow Mikasa volleyball has been approved by the Federation Internationale de Volleyball. 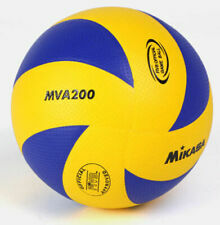 The new MVA200 changed the way we all look at volleyballs. Never has there been a more highly engineered ball with such world wide acceptance. 2-Year Warranty. Embossed and dimpled surface. Size 5 - Official. 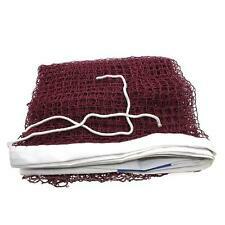 Material: Made from high quality PU;. What you see is what you get ! Great gift & collection for Fans ! Material: PU Synthetic leather. Color: as the picture. Size: VSM 5000. Quality: High quality. Never has there been a more highly engineered ball with such world wide acceptance. 2-Year Warranty. Model: MVA200. - Size 5 - Official. SUPER-K PVC BEACH VOLLEYBALL. I have a pool that we play water volleyball in and I am on my third ball in one year. 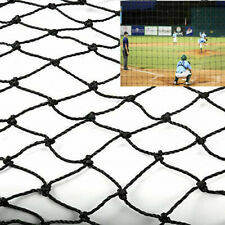 The problem is that any ball with sewn seams or glued seams do not hold up for long. (SUPER-K Funny Face Volleyball Ball TPU Soft Touch Size 2 Training Ball SAC50224. SUPER-K 2# FUNNY FACE TPU VOLLEYBALL. MATERIAL: TPU, RUBBER BLADDER. COLOR: YELLOW. SIZE: 2# （15.2 15.2 15.2cm). Unwanted Goods. Material: PU Synthetic leather. Size: VSM5000. Quality: High quality. From Japan. Made in JAPAN. Color : Black. Middle East. Volleyball Spike Training Aid & Hitting Serving Trainer. Great ! Luxury design. Volleyball Training Aid.SmartSpike Volleyball Spike Trainer. Special for indoor & outdoor. Build skills faster.Athlete from 6 to 30 years old. Volleyball coaches know hitting skills are not developed overnight, taking years of playing experience for a player to master the correct footwork, approach, and arm swing to maximize their hitting potential. MIZUNO (Mizuno). Body: polyester, rubber, rayon, other pad: EVA 1 pcs | M, L size (total length: 20cm) Unisex size. the manufacturer will change contents, date and quantity for sale. Blue Ray --- Region A. Length (Heel to Toe): 11.5". Bottom soles are slightly dirty but tread is not worn down. Sides of shoes are dirty. Heels and toes are dirty. Insoles: 10.25". New Mizuno Volleyball Shoes Wave Lightning Z5 V1GB1900 Freeshipping!! Mizuno Performance Highlighter Crew Socks. Comfortable, lightweight and right and left specific design make the highlighter socks a must-have. Mizuno Runbird logo on lateral side of ankle and on top of foot. Style: 3005 Indoor. New without box. The Wilson i-COR volleyball line is designed to fit any team's needs. I-COR is the force to be reckoned with on the court. • USA Volleyball and NFHS approved. WARNING WARNING:� This product can expose you to chemicals including TDI, which are known to the state of California to cause cancer and birth defects or other reproductive harm. 1 Supporter include, not pair. Size : M (circumference in the knees 32 - 38 cm). Color : Black. Our Products are 100% Authentic. Pit to Pit 22 " Back Collar to Hem 27 ". It would help us understanding you. Manufacturer's Part Number: WTH7700XRWB. The Wilson i-COR volleyball line is designed to fit any team's needs. I-COR is the force to be reckoned with on the court. USA Volleyball and NFHS approved. WARNING WARNING:� This product can expose you to chemicals including TDI, which are known to the state of California to cause cancer and birth defects or other reproductive harm. ● Manufacturer part number: 59SS309. ● Elbow Supporter / Elbow Supporter (1 piece). Titleist Japan Golf Round Ball Case Pouch Bag w/Hook AJBC62 Black. ★ 01: White. Country of Manufacture.Item are manufactured in other country (China, Vietnam etc) if the item is not described "Made in Japan " on the list. The man, the myth, the volleyball. Mr. Wilson, yes the Mr. Wilson from the movie "Cast Away", has proven his prowess as a captive audience, compassionate listener, and dear friend on the silver screen. 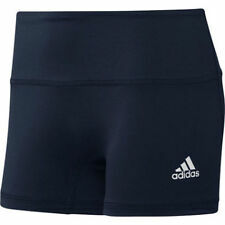 Mizuno Volleyball Spandex Shorts Black Volleyball Spandex Victory Short 3.5"